China will report GDP growth figures for the fourth quarter of 2018 early on Monday at 0200 GMT, potentially injecting further volatility to the markets as investors search for more convincing clues on how bad the US-Sino trade war can hurt. Forecasts are for a slightly smaller annual expansion of 6.4% (1.5% q/q), the lowest rate achieved in almost a decade. 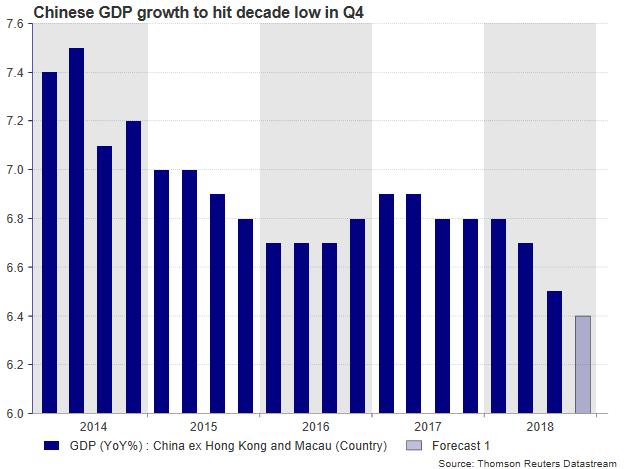 In the third quarter, the Chinese economy geared down for the third consecutive time, marking an annual growth rate of 6.5% (1.6% q/q) – the weakest registered since Q1 2009. 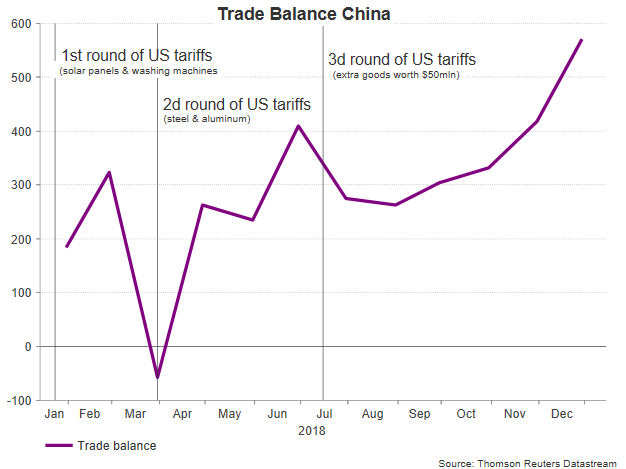 The data was interpreted as adding evidence that the US tariffs and the growing uncertainty about how long the trade drama will continue have already started to bite economic activity in the world’s second biggest economy, with investors speculating that it won’t take long for other economies to feel the pinch as well. Stocks plunged, and the yuan tumbled in the wake of the data, forcing the People’s Bank of China to cut reserve requirements from banks to mitigate any upcoming downturn with more liquidity. The government seems stressed itself too. Despite trade surplus with the rest of the world hitting three-year highs in December, the Ministry of Finance promised to slash taxes at a larger scale especially for small businesses and step up fiscal expenditures as the negative export figures and a contracting Manufacturing PMI flagged that the slowdown in the business sector might be more than temporary. Meanwhile, policy sources revealed that the growth target for 2019 could be set between 6.0-6.5% when the Parliament meets in March, a less ambitious goal than the “around 6.5%” target agreed for 2018. Support also looks to be lacking on the demand side, with retail sales holding in a downtrend since the start of 2018, something Apple underlined in its recent sales guidance when it said that its sales were performing poorly in the region. The falling inflation which deviates below the central bank’s 3.0% target is another worrying sign of cooling domestic consumption which leaves more room for the central bank to loosen monetary policy. Although it’s still unclear which of the two countries will lose the most in the trade war game – the US economy has also softened in several areas – another downbeat GDP report would confirm that US protectionism has made things difficult for China. The news will be particularly unpleasant to the ruling Communist Party which aims to make China the hub of technological intelligence by 2025 through its strategic “Made in China” plan. In other words, with Washington pressing for more protection of its technological knowledge and tariffs restricting expansion in China, Xi Jinping might fall behind on his policy agenda. In market reaction, besides the yuan, the aussie, a popular liquid proxy for China plays, is highly expected to show an immediate response to growth figures. 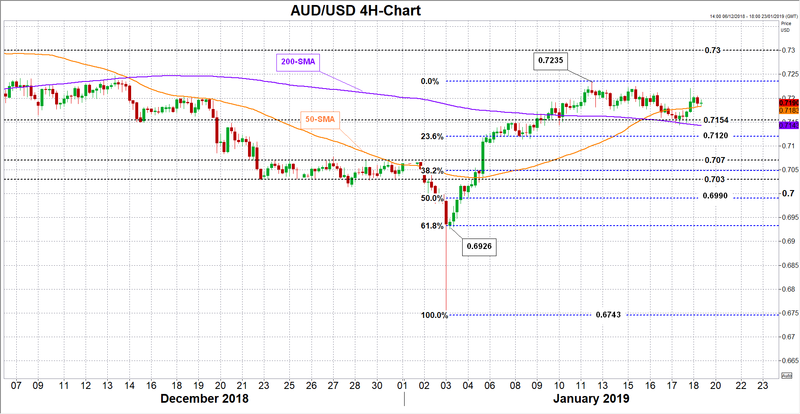 A larger-than-expected deterioration in Chinese economic activity could signal that Beijing may turn more careful with its Australian product purchases in the near future, sending aussie/dollar down to the 0.7154-0.7120 area where the 200-period moving average in the four-hour chart and the 23.6% Fibonacci of the upleg from 0.6743 to 0.7235 are placed. Slightly lower the region between 0.7070 and 0.7030 could be restrictive as well, while steeper declines may pierce the 50% Fibonacci of 0.6990 to reach the 0.6926 low. Alternatively, a beat in the data may increase speculation that the world’s number two economy is more resilient to US trade barriers than markets believe, helping the pair to improve towards the 0.7235 top. A significant break of this important obstacle could bring more buying into the market, driving the price probably up to the 0.73-0.7340 resistance zone. Retail sales and industrial production figures for the month of December will be also published on Thursday at the same time. The former is expected to inch up by 0.1 percentage points to 8.2% y/y, while the latter is seen weaker by an equivalent percentage at 5.3% y/y.